So what flicked the switch to get Estee Lauder?.... Gift time! haha At the time of purchase, there was a gift promo where if you buy any product/s for over AUD$75 you get a makeup bag with goodies :) That's good enough reason for me to jump and buy one plus the makeup bag is so cute (slightly in shot in the photo above) and it has all the travel size skin care items that will be of great use in my upcoming holiday... so really it's a win-win situation. What do I think about the product? I would actually pay for a good moisturiser (tinted or not) so it wasn't a big deal. But if you ask me then yes it is on the a less affordable side of things. This is sold at AU$80 for 50ml. Superb! it's easy to carry around your makeup bag for travel purposes and it's hygienic because you don't need to stick you finger to get the product out. 4. It sinks in a little slower so make sure that you let it sit for a few minutes before applying makeup. 2. 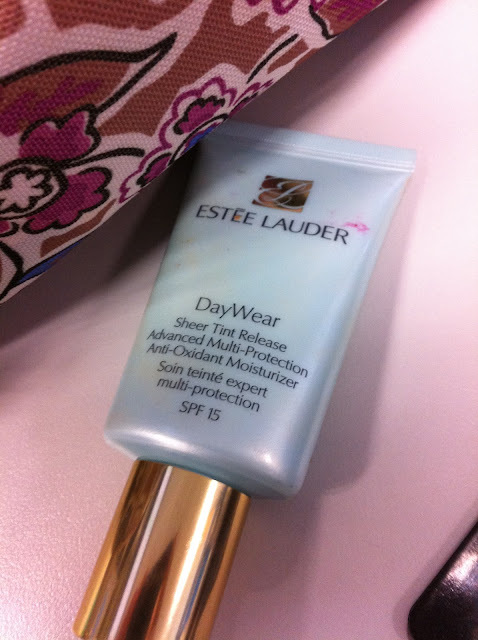 It only has SPF15 so if you're going to the beach, then this is not enough sun protection for the face. 3. You can layer it but it won't really give a full coverage. Your (cute) freckles are still going to show. Also the Queen of England is visiting my state today :) Yay for long holiday!